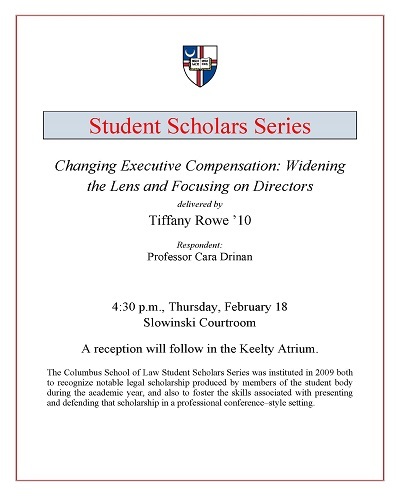 Tiffany Rowe, a fourth-year evening student at Catholic University’s Columbus School of Law, makes a persuasive case that executive compensation is too often calculated by irrational standards. Her address argued that the cult of celebrity that sprang up around well-known CEO’s in the 1990s directly fueled the astonishing growth of top executive paychecks over the past couple of decades. Rowe, Tiffany, "Changing Executive Compensation: Widening the Lens and Focusing on Directors" (2010). Student Scholar Series. 2.